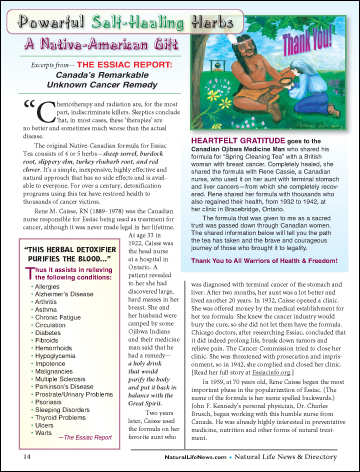 Excerpts from “The Essiac Report: Canada’s Remarkable Unknown Cancer Remedy” Chemotherapy and radiation are, for the most part, indiscriminate killers. Skeptics conclude ‘hat, in most cases, these ‘therapies’ are no better and sometimes much worse than the actual disease. The original Native-Canadian formula for Essiac Tea consists of 4 or 5 herbs—sheep sorrel, burdock root, slippery elm, turkey rhubarb root, and red clover. It’s a simple, inexpensive, highly effective and natural approach that has no side effects and is available to everyone. For over a century, detoxification programs using this tea have restored health to thousands of cancer victims. ﻿Rene M. Caisse, RN (1889–1978) was the Canadian nurse responsible for Essiac being used as treatment for cancer, although it was never made legal in her lifetime.